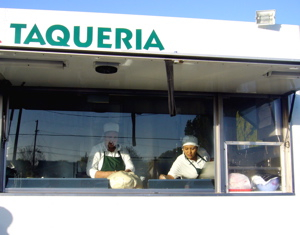 I’m still in mourning for the afterhour taco stand that was once wedged in front of Taqueria Vallarta. Huddled outside, bundled against the night air and only slightly buzzed, I’ve enjoyed many a midnight snack. At first, I alternated my orders, enjoying beef and pork, grilled and fried, sausage and offal. Eventually, though, the tender suadero owned me completely. I know, I know. A 49 on the health inspector’s score card justifies, in the modern logic of cleanliness and public safety, the shuttering of a restaurant. I only wish they’d let the taco cart stick around. Bereft, a friend and I recently wandered up and down 24th Street, sniffing the air for potential rebound consolation. We were in luck. A few doors down from our old taco love, inside a tiny space that was a butcher shop by day, an impromptu taqueria had been set up to serve the swing shift. A thin haze of smoke drifted from the shop, and once inside, we realized that three card tables and a portable grill were the only capital investments in this brand new micro-business. No fire extinguisher or ventilation hood in sight. No menu, no music, no English, and no smiles. Still, the minimalist approach was more than justified by the perfectly charred beef. We returned a few nights later but were disappointed to find only a dark, properly locked-up butcher shop. For all its bragging about being a culinary capital, San Francisco is woefully behind the curve when it comes to good street eats. The occasional downtown hot dog stand and farmers’ market tamale stalls are just not enough for this hungry girl. Where I come from, you can’t walk twenty feet without someone grilling or steaming or frying or stacking or stirring something good to eat al fresco, but here in America, fast food ordered through a squawk box from your car is apparently safer for you. Fortunately, immigrants from lands of good food persist in their attempts to share their treats. Whispers of â€œyou want tamales?â€ from parked minivans have lured me to steaming bundles of masa joy, while contraband rice cakes reach me through trusted intermediaries. In between such priceless finds, though, it’s the taco truck that assuages my need for street food. Returning from a hiking trip in Big Sur one weekend, my hubby and I were craving some filling, warming soup. With San Jose just a few miles in front of us, we plotted a minor detour from 101 around Capital Expressway up Senter Avenue to one of my favorite Vietnamese restaurants on this side of the Pacific. 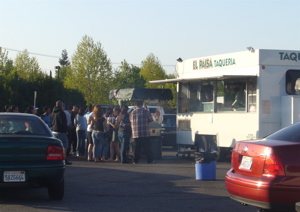 But before we got very far north on Senter, one stoplight to be exact, we saw a line snaking its way from a shining, white taco truck all across a parking lot to the curb on the corner. Hubby’s quick reflexes pulled us right up next to Paisa Taqueria, our quest for pho and bun rieu immediately forgotten. The best way to identify a good taco truck: a long line even in the middle of the afternoon. Now, this wasn’t your normal taco truck. This was a special tricked-out version that boasted large, squeaky clear display windows through which you could watch women patting and pressing corn tortillas to order. A trompo of glistening pork spun invitingly at the other end of the truck. A few feet away was the grill station: what normally served as a hot dog cart was lined with glowing, hardwood charcoal from Mexico. The salsa station included the usual fresh and cooked salsas, lime wedges, crisp radishes, and a delightfully creamy guacamole-style sauce. Large jars of agua frescas sparkled in the sun. Fortunately, the wait wasn’t as long as my empty stomach feared it’d be. I ordered my usual suadera and carnitas, and then decided to try one of their mulitas, a sandwich of two grilled tortillas and melted fresh cheese. I had barely ladled and stacked my numerous cups of salsa when our food appeared in the window. Like everyone else, we scurried back to our car to eat. The tacos were exactly the way I like them: small and simple. A light sprinkling of chopped onion and cilantro were the only gilding on the meat, while the freshly made tortillas had that perfect balance of softness and toothsomeness. Gone were the soggy pile of beans; the limp, torn, stale tortillas; and the massive, messy hump of filling found in far too many so-called taquerias. I’m not sure how often I’ll get down to San Jose for a plate of tacos, even ones as good El Paisa’s. I guess that means more midnight strolls sniffing the air and praying for benevolance from the street food gods. Learn lots about tacos, including the Lebanese â€œsheep herderâ€ roots of al pastor and the difference between lard-cooked carnitas, steamed cabeza, and luscious suadero at this informative guide to Mexican street tacos. Spanish speakers can brush up on their taco knowledge while ingesting a bit of taco history at Mexico’s official Taco Day site. 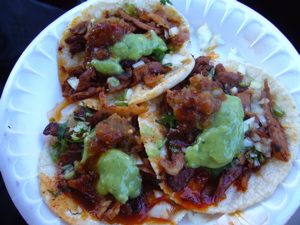 Anyone heading to LA should definitely compile a list of taco trucks from the impressively well-researched Taco Hunt blog.